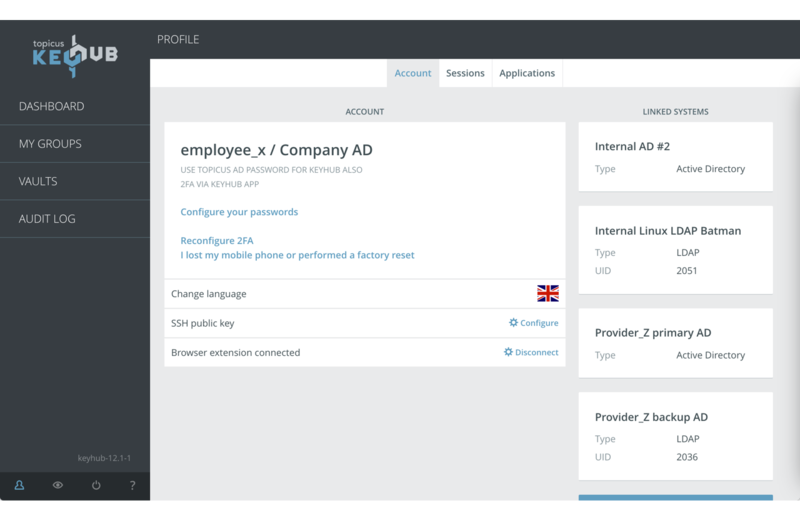 With Topicus KeyHub, digital access management becomes easier and more secure, with more awareness of employees and less overhead on IT. Thanks to decentralised authorization, responsibility is back where it belongs: at the business end of an organisation. Transparency in security ensures security, awareness, higher productivity, less overhead and responsibility where it belongs. Secure access to all digital environments, servers and applications. Working safe and secure becomes standard. Prevent shadow-IT and keep your DevOps productive. KeyHub secures access to servers and virtual machines and provides certificate management. Every day a new password is automatically generated for all linked systems. When enabling a group, this password is provisioned at real time to the connected directories. Every event that applies to you or one of your group membership is displayed here. This creates transparency and social control on access management. For access to certain systems or groups you might want to enforce explicit argumentation before access is granted. This is stored in the audit trail and presented to all group members on their dashboard to create transparency and awareness. Search for passwords and other secrets straight from your dashboard. Ease-of-use is key in security. 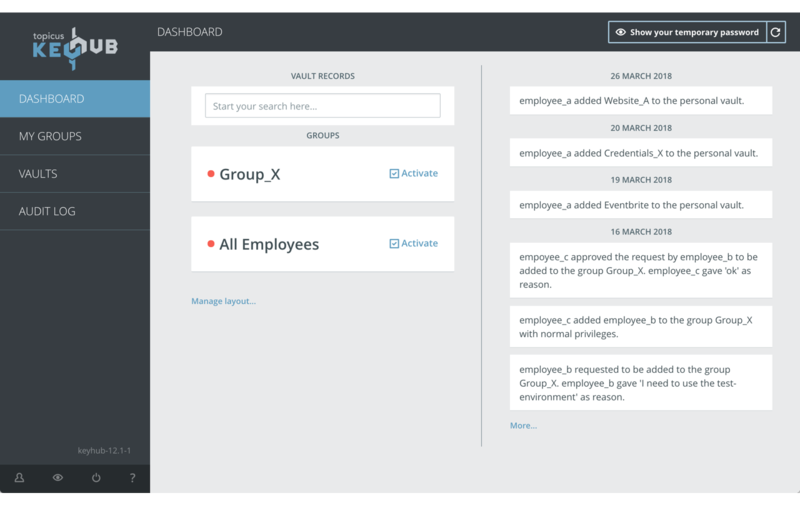 Time-based real-time provisioning ensures that all accounts on linked systems are inactive when not required by employees. Only if specific access is required, a group is activated which activates your personal account(s). After a predetermined time period your accounts are deactivated automatically. The main menu as it applies for regular users. Clean and easy. New secrets can quickly be added and places in the right groups. Instant sharing of credentials with all group members. Every user in Topicus KeyHub has their own personal password safe. This prevents professional passwords in private password managers. 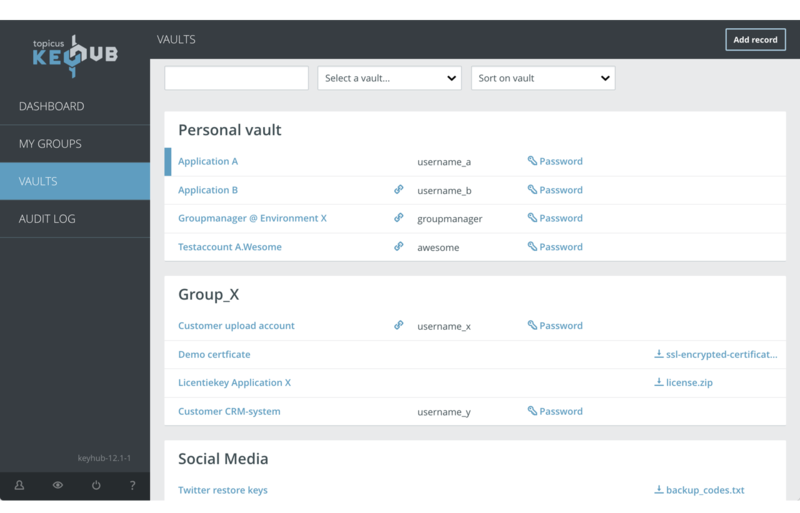 Every group in Topicus KeyHub has its own vault to share passwords, certificates and other secrets with all group members. Store certificates and other files in group safes to safely share them with group members. Add expiration dates to certificates and receive timely notifications when they need to be renewed. Topicus KeyHub comes with a complete team-based password manager, including a personal password safe for personal, professional passwords. Overview of all your sessions and the possibility to manage them. Overview of all applications you have access to via Single Sign-On. Including your consent and the possibility to withdraw. See your details on all linked systems like Active Directory and LDAP. Allow users to reset their own 2FA. The user interface of Topicus KeyHub comes in three languages: Dutch, English and German. Topicus KeyHub has SSH-key provisioning support. No more passwords on UNIX systems. Topicus KeyHub has its own browser extension for Google Chrome and Mozilla Firefox to conveniently apply passwords that are stored in KeyHub. Read all about the magic that resides behind the smooth and simple user interface of Topicus KeyHub. 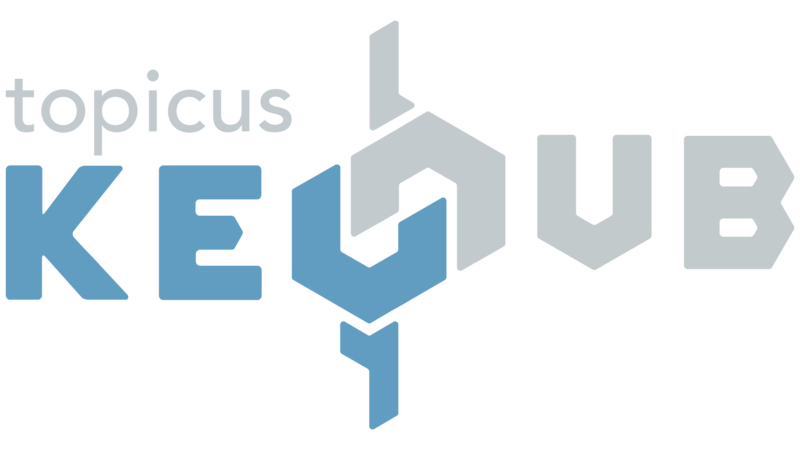 To see Topicus KeyHub in practice with all benefits especially pinpointed to your organisation, just send us a message and we will schedule a demo!